Finding the Best Back Brace for Sciatica is easier than you think. Here’s a rundown of our favorites, including our top pick – Bodymate Compression Wrap. Sciatica is a common condition characterized by pain that radiates along the sciatic nerve. With sciatica, most people feel pain, numbness, weakness, or tingling down the back and outer side of the leg. Wearing a back brace has been found helpful in relieving symptoms caused by sciatica. When properly fitted, a back brace can provide just the right amount of compression needed to support and stabilize the lumbar region. As there are many choices of back braces on the market, we’ve tested and compiled a list of the very best options available. Type: There are several types of back braces on the market that target different areas of the back. Choose a brace for the lower back for sciatica relief. Comfort: If you have sciatica, you may need to wear your back brace for several hours during the day. Therefore, your brace should be made of a comfy material. Flexible: While a back brace is designed to be fairly rigid for proper spine support, it should have some flexibility to allow for full mobility. Light: For maximum comfort, choose a back brace that is lightweight and breathable. Sciatica pain can be excruciating, especially if left untreated. Fortunately, the right back brace can help reduce symptoms without breaking the bank. 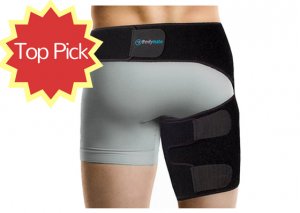 Our top choice for best back brace for sciatica is the Bodymate Compression Wrap. This unique wrap is exclusively designed to lessen pain caused by sciatica, injuries, and muscle strains at the hip, quad, groin, thigh, and hamstring. Simply attach the wrap around the lower back and on the thigh that you’re experiencing the sciatica nerve pain. The Bodymate back brace is constructed from a breathable neoprene material that helps to comfortably compress the back and leg while remaining cool and comfortable, even with all day use. The brace comes in a universal size but is equipped with latching Velcro straps that allow you to achieve the perfect fit. When worn as instructed, the brace also increases blood flow to the area and reduces recovery time by speeding up healing. 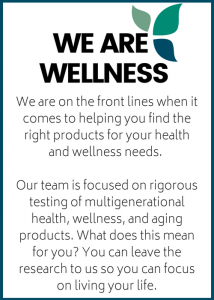 We love that this purchase also comes with a 100 percent money back guarantee. Great for the gym – love it! Say goodbye to sciatica pain with the ComfyMed Breathable Mesh Back Brace. Designed for the treatment of sciatica, herniated disc, scoliosis, and degenerative disc disease, this unique back brace wraps comfortably around the lower torso to compress the area and relieve pain, weakness, and tingling caused by the sciatic nerve. 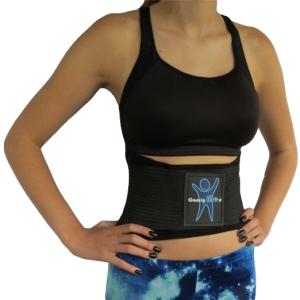 This unisex brace is available in sizes ranging from 26 inches to 50 inches, making it the perfect option for men and women of all sizes. It’s also made from high-quality materials for long-term use. In addition to being lightweight and comfortable, this innovative brace is also washable and allows freedom of movement. 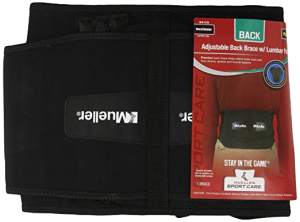 Our next choice for best back brace for sciatica is the SmartBrace 5-in-1 Adjustable Support. 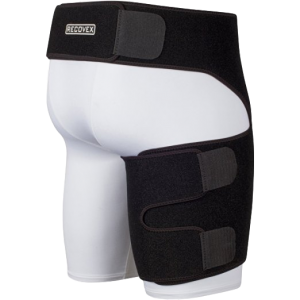 This innovative brace is the original multi-use brace featuring a waist and thigh design that helps to target the sciatica nerve at all locations in the back and leg. It’s also the only brace engineered with BioCompression Technology. This one back brace has five different uses, including targeted compression for the groin, hip, thigh, hamstring, and sciatic nerve. 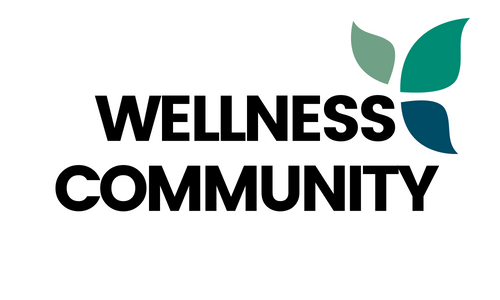 It’s also useful during recovery after an injury, surgery, or related condition. The slip-resistant material helps to ensure that the brace remains comfortable and in-place. The neoprene material offers therapeutic heat. If you need fast relief from sciatica pain, you need a quality back brace. After testing numerous options, we found the Mueller Adjustable Back Brace with Removable Pad to offer the perfect balance of comfort and compression. This unique brace is designed to reduce lower back pain caused by sprains, strains, muscle spasms, and sciatica. Constructed of polyester, rubber, and nylon, the brace offers flexibility while remaining soft and non-irritating on the skin. Removable lumbar pad cushions add extra comfort and flexible steel supports help stabilize the spine. The brace also contains an internal molded plastic piece that prevents the brace from bunching or rolling up. Our final choice for best back brace for sciatica is one that has many great functions. The Amazing Back Brace Belt by Didakay is the ultimate choice for lower lumbar support, sciatica management, heat therapy, and several other functions. The heated element in the brace helps to increase circulation as the heat penetrates deep into the muscles. The result is relaxed muscles and a reduction in weight around the waistline. The high-quality nylon and Velcro attachments also help create the perfect fit. This innovative back brace features high-tech infrared thermal acupuncture material that forms negative ions that boost blood circulation for long-lasting comfort. For women suffering from menstrual cramps, the brace can be turned around to heat the abdomen area for nearly instant relief. 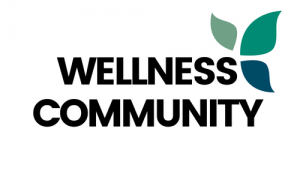 With your purchase of the Amazing Back Brace Belt you’ll receive a bonus e-book that teaches you how you can handle back pain in a natural way. The brace also comes with a 100 percent money back guarantee.